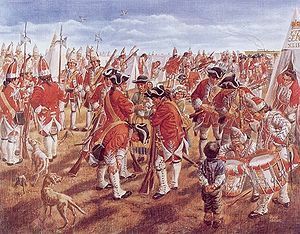 The Battle of Fort Beauséjour marked the opening of a British offensive in the French and Indian War (the North American theater of the Seven Years' War). Beginning June 3, 1755, a British army under Lieutenant-Colonel Robert Monckton staged out of nearby Fort Lawrence, besieged the small French garrison at Fort Beauséjour with the goal of opening the Isthmus of Chignecto to British control. After two weeks of siege, Louis Du Pont Duchambon de Vergor, the fort's commander, capitulated on June 16.